The Placentia-Yorba Linda Unified School District values the active role parents take in their child’s education. In order to support this relationship, the District is implementing a parent education program entitled “Parent University.” Free workshops on various education topics will be offered throughout the year. 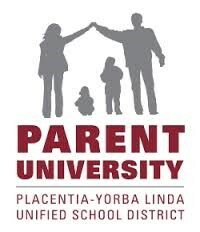 For more information check out the Parent University page on the PYLUSD website. We will offer free workshops on various educational topics throughout the school year so parents can become better equipped to support their child’s learning. Research indicates that when schools work together with families to support learning, students perform better in school and throughout life.